As if college weren’t expensive enough, living costs on top of tuition fees can be a nightmare to pay. Off-campus housing, food, and transportation can all be costly for those on the typical college budget. Fortunately, college towns vary dramatically. With a cost of living that is around 12% lower than the national average, Ohio is a much more affordable place to live than many of its neighbors in the Midwest. This is good news for students attending any of Ohio’s more than 130 colleges and universities. Our editors used Wikipedia to make a list of every college town in Ohio, then used Sperling’s Best Places to rank them on general affordability. To figure out which college towns are most affordable, we looked at costs for housing, food, health, transportation, and utilities, and compared them to the national average. We also considered features like amenities, crime rates, public transportation, and overall quality of life before narrowing our list down to the 20 most affordable college towns in Ohio. With its small-town feel, unique history, lush green spaces, and gorgeous collection of historic buildings, Youngstown was recently named the best college town in the Midwest (by America Unraveled). Forbes.com even ranked Youngstown as the fourth best city in the U.S. in which to raise a family, citing the town’s low crime rate and great cost of living. An active local sporting scene offers plenty of opportunity for athletes and sports fans alike, while a community theater, full events calendar, and walkable downtown area make for great pastimes. Food, healthcare, transportation, and entertainment costs are all less than the national average, while housing costs of only 26% of the U.S. median make it easy for students to live well in off campus homes and apartments. With a full-time population of about 5,300, and a college of almost 5,000 students, Nelsonville is the very definition of a college town. Hocking College, known for its technical programs, is a mere three-minute drive from the picture-perfect downtown. With housing costs more than 60% less than the national average, students in Nelsonville can live in a prime location without breaking the bank. The town’s calendar is chock-full of local events, and a healthy tourism scene contributes to the solid local economy. If there is a rule that says cities aren’t college-budget friendly, then Akron is the exception. Akron’s surprisingly low housing costs, only 35% of the national average, are definitely a rarity among other mid-size cities, as is Akron’s lower rates for healthcare and entertainment. With all the money Akron residents save on housing, they can afford to take advantage of the city’s many features and attractions, including museums, a civic theater, the F.A. Seiberling Nature Realm, a zoo, a concert venue, and much, much more. Though not a traditional college town, Columbus tends to be dominated by the 58,000 students who attend The Ohio State University. North of downtown, nearly every shop, restaurant, cafe, and bar seems to cater to the city’s massive student population. Between the university and the city, there are plenty of budget-friendly options to fill one’s time, including Mirror Lake, the art galleries at Wexner Center for the Arts, and beautiful Thompson Library, to name but a few. The cost of housing is roughly half that of the national average, while food, healthcare, utilities, transportation, and entertainment all also average less than the national norm. With a slew of colleges and universities, a young and vibrant atmosphere, an ideal Midwest location, and a cost of living that is less than most other cities its size, Cincinnati is a fantastic place to spend one’s college years. Housing costs are about half the national average, and there are a great variety of apartment and homes to choose from in and around the city. Similarly, food (lots of great restaurants), healthcare (world-class hospitals), utilities, transportation, and entertainment (two professional sports franchises) costs are below the U.S. norms. Who wouldn’t want to live in a place that has declared itself “The World Headquarters for Nice People?” Ashland is an inviting small town with a student population that adds a unique level of zest and energy. Cost of living here is lower than both the national and state averages, and students who want to live off campus can expect to pay somewhere around $500 for a one-bedroom apartment. Costs for food, utilities, and entertainment were also below the national norm, while costs for healthcare and transportation are only slightly higher. Tiffin is home to two major universities: Tiffin University and Heidelberg University. With a cost of living that is lower than both the national and state averages, Tiffin is a great place for students, young professionals, families, and retirees. A nature center, a theme park, and various museums are popular tourism destinations, while public libraries, parks, and a walkable downtown area provide residents with everything they need for a high quality of life. Food and entertainment costs in Tiffin are right on par with the national average, but healthcare, utilities, transportation, and housing are lower than the national norm. Kent has changed dramatically in recent years, and has established itself as even more of an energetic and charming college town. More than $100 million in private and public investments have revitalized both the campus and downtown, the latter of which now hosts dozens of student-friendly restaurants, shops, and clubs. Though Kent’s cost of living is more than 10% lower than the national average, this upscale-feeling community costs more than the Ohio norm. Fortunately for students, most of those higher costs are in the categories of utilities and transportation; housing is still only about 66% of the median U.S. cost. College of Wooster students are likely to find the town of Wooster to be an upscale and sophisticated place. The walkable downtown area is a nice place to stroll, and is lined with locally owned shops, boutiques, and cafes. Food costs here are about 4% less than the national average, which is good news considering Wooster’s top-notch restaurant scene. The Wooster-based Ohio Light Opera provides great entertainment, while Ohio’s Amish country starts just outside of town. Though it’s located only 15 miles from downtown Cleveland, Berea is a small, tight-knit community with a long history as a college town. Indeed, Baldwin Wallace University was founded in 1845, less than a decade after Berea itself. Today, the quaint downtown is still charming and historical, with locally owned shops and restaurants interspersed with big city-type stores and amenities. Though food and healthcare costs both rank higher than the national average, housing costs come in at only 65% of the national norm. Home to Bowling Green State University, the town of Bowling Green is both safe and affordable. Plus, its laid-back vibe makes it a great college town in which to live and work. The cost of living here, though slightly higher than most other towns in Ohio, is easy on a student wallet. Only transportation costs average higher than the norm, while food, healthcare, utilities, and entertainment costs are all below the national average. Students looking to live off campus will be glad to know that Bowling Green has a variety of housing types available around the campus, and housing costs average only about 76% of the national average. Called one of the “Top 100 Communities for Young People” — twice! — by America’s Promise Alliance, Findlay is a small Ohio town with a well-respected university, fun local atmosphere, and cost of living that should put a smile on anyone’s face. Housing costs are only about 72% of the national average, meaning a student can get a one-bedroom apartment for around $650. Utilities, transportation, and healthcare are also less than the norm, with low healthcare costs being especially good news considering Blanchard Valley Hospital in Findlay is consistently ranked amongst the best hospitals in the nation. Oberlin has been a college town since way back in 1833, when both the town and college were founded together by a Presbyterian minister and a missionary. Today, the town of a Oberlin is an energetic, politically active place well known for its progressive student population. While food costs are nearly 11% higher than the national average, a wide variety of student budget-friendly restaurants and cafes exist downtown. And while healthcare, utilities, transportation, and entertainment costs are all slightly above the national norm, students wanting to live off campus will be happy to know that Oberlin housing costs are only about 64% of the national average. Home to Miami University, Ohio’s second oldest university, Oxford is the epitome of a charming college town. 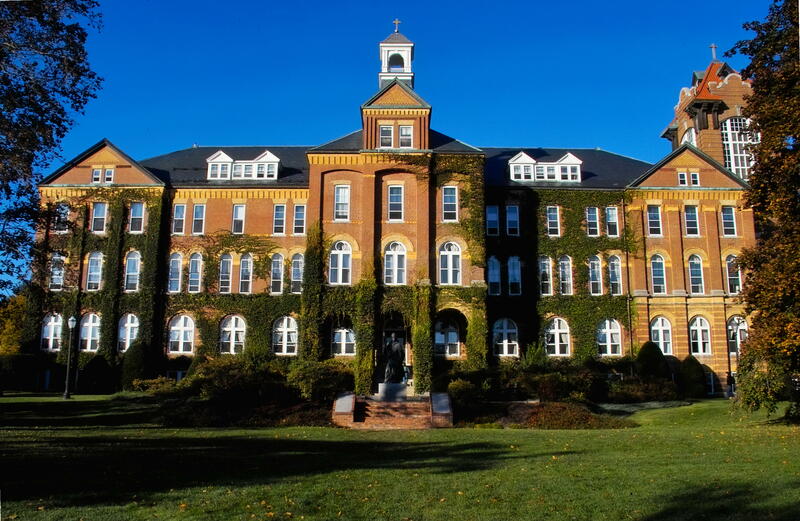 The university, which boasts 2,100 acres, 188 buildings, and 18,000 students, is easily the town’s main employer. Because the local economy is so rooted in the university, students have plenty of budget-friendly housing, food, and entertainment options to keep them busy. Oxford’s downtown (called “uptown” here) is a charming place for a stroll, while Hueston Woods State Park, located just north of town, is the perfect getaway spot for a day of hiking, boating, or golf. Home to the oldest college in Ohio, Athens is an upscale community that manages to simultaneously be both laid-back and tons of fun. With the exception of getting around (there’s not much public transportation here), Athens’ cost of living is higher than the Ohio average, but below that of the national. The historic downtown boasts popular restaurants and breweries, and a growing arts and music scene. Students who enjoy a good time will especially love Athens come Autumn, when the town throws a Halloween bash that attracts folks from miles around. Hiram is perhaps best known as a former home of President James Garfield, but it’s also the home of Hiram College (where Garfield attended and even taught). The historic downtown makes for a nice student hangout, and restaurants like Gionino’s Pizzeria are particularly popular among Hiram students. For those who love the outdoors, Hiram is the official launching point for canoe tours of the Upper Cuyahoga River. An upscale community, Hiram’s overall cost of living is just a hair under the national average, though healthcare, housing, and entertainment costs are all below the U.S. median. Home to top-ranked Kenyon College, Gambier has a cost of living that is above the Ohio average, but right on par with the national norm. Part of the reason for Gambier’s higher cost of living is its beautiful rural setting. Situated among gently rolling hills and bordered by the Kokosing River, Gambier is quaint, charming, and tight-knit. The downtown has shops and restaurants to provide residents with the necessities, while those who occasionally need big city amenities will be happy to know that Columbus is less than an hour’s drive away. For those who like their college towns to be artsy and quirky, Yellow Springs won’t disappoint. Home to Antioch College, this tight-knit little town is a fun and vibrant community full of students, artists, entrepreneurs, and other creative types. The community calendar is chock-full of street fairs and other artistic events, while the Glen Helen Nature Reserve and nearby John Bryan State Park are the perfect places to relax and find inspiration. Housing, utilities, transportation, and entertainment are all a few ticks above the national average, while food and healthcare costs average well below the U.S. median. 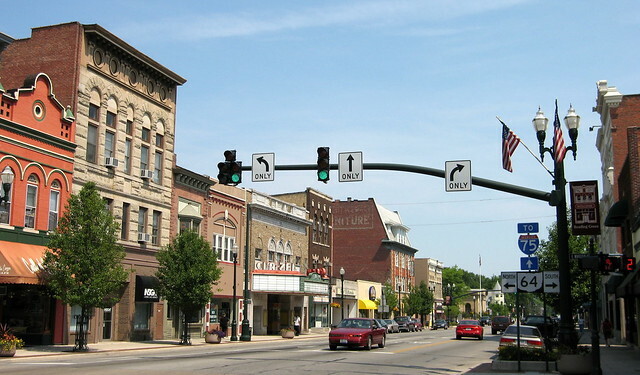 Home of Denison University, Granville is a charming and upscale small town located about 30 miles east of Columbus. The town has a distinct New England feel to it, especially the downtown which is lined with historic buildings. Though Denison’s campus sits atop a hill, students often trek into town to take advantage of the many unique shops and restaurants which cater to the student population. Only housing in Granville average higher than the national average. That’s good news for Denison students living on campus, as food, healthcare, transportation, and entertainment costs all average below the U.S. norm.